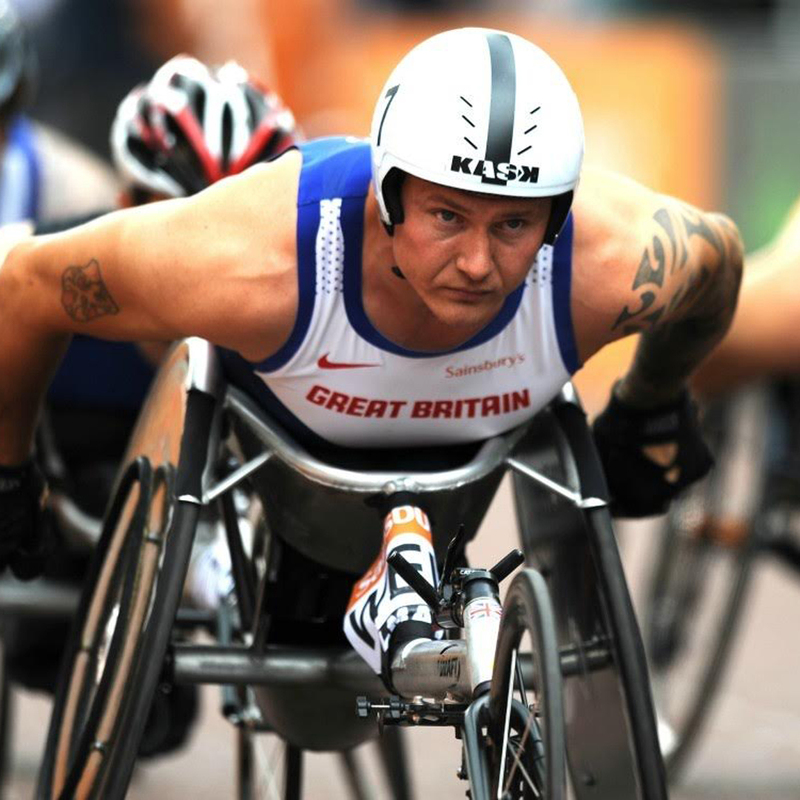 One of the UK’s most prolific sportsmen, British Paralympic wheelchair athlete David Weir, CBE is a six-times London Marathon winner as well as winning a total of six gold medals at the 2008 and 2012 Paralympic Games. 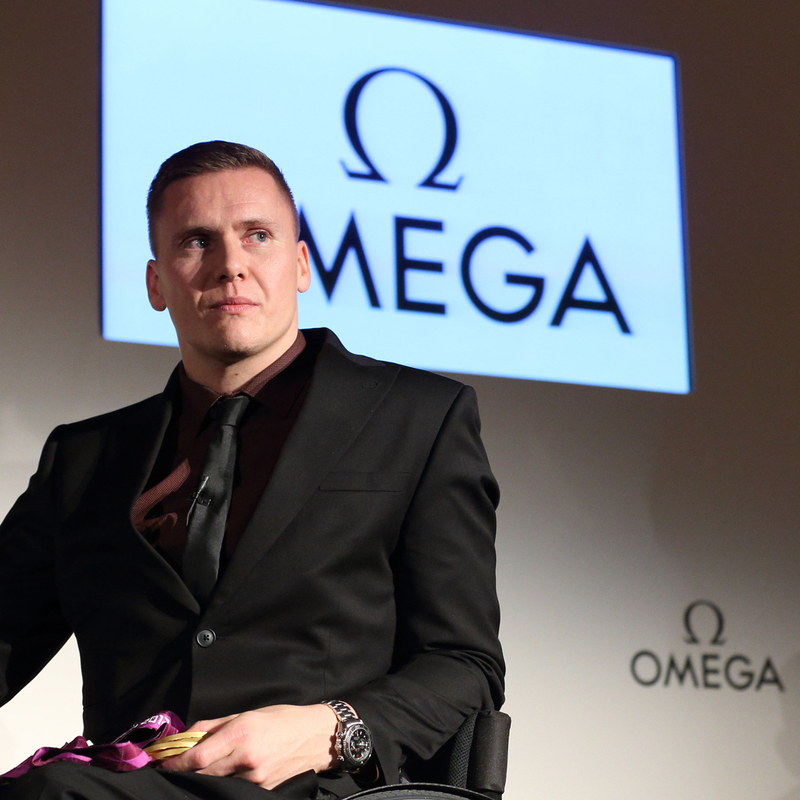 “Since London 2012 Paralympic sport has gone from strength to strength and that makes me so proud. In my eyes, the event is now reaching the same level as the Olympics – and that was certainly the case at the last Games when the stadium was sold out for every event. This was absolutely amazing to see – and indeed to hear when I raced at the Stadium at Queen Elizabeth Olympic Park. 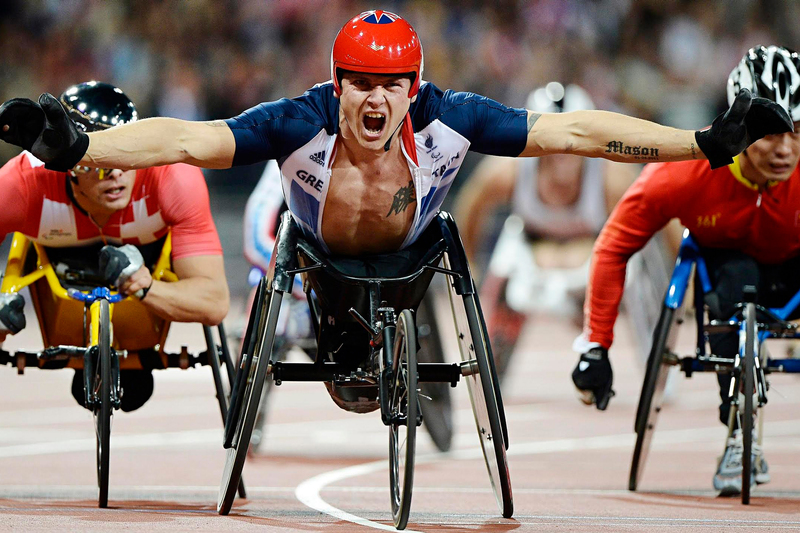 I think that we have really built on the buzz that 2012 created Para-sport has progressed a lot and the Paralympics has certainly had a huge impact on my sport. For example, before the London Olympics there were only 20 races at Stoke Mandeville and now, less than four years later, there are over 90 races – in fact I am competing in one today [7 may 2016]. These numbers simply speak for themselves. Going to Rio after being so successful at London 2012 could put a lot of pressure on me as an athlete but, to be honest, I am just really looking forward to being back on that big stage defending my titles. At the same time, I am very hopeful that this August will prove to be yet another Golden Summer for sport as a whole as well as for me and Team GB. 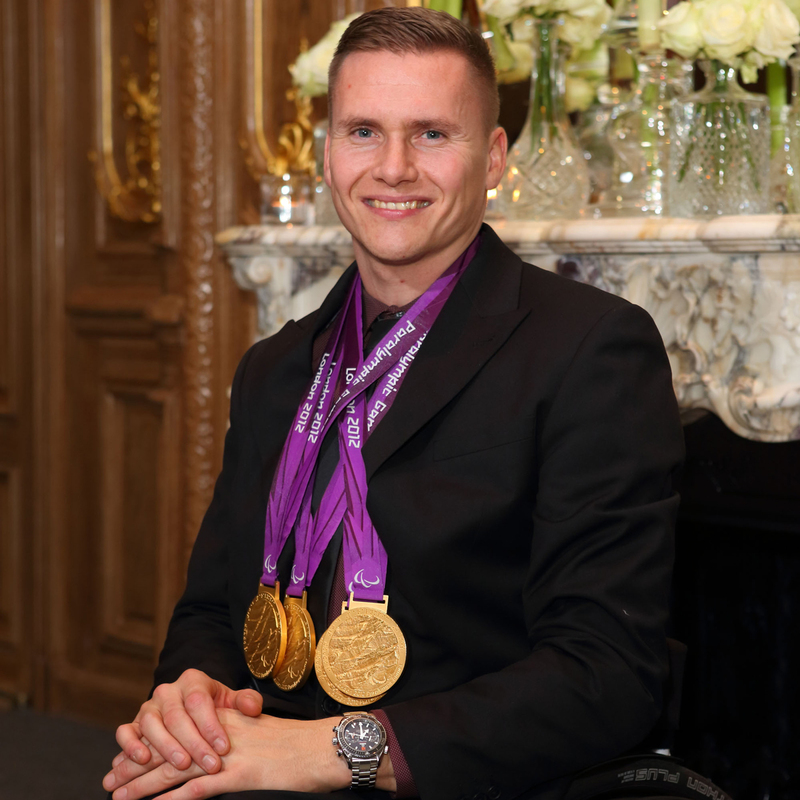 Among other titles, I have been fortunate to win six Paralympic and six World golds, as well as six London marathons. I am very proud of all my acheivements but winning my first Gold Medal at London 2012 has to be the one that means the most, as well as all the accolades that followed the Olympics that year, such as my CBE. My races revolve around time itself and this involves long, hard, intense training sessions on a daily basis. I have to endure these every day to become the best I can be both on and off the track. But when I get home to my family I switch off completely. My partner Emily and my children keep me busy and this is exactly the distraction I need when I’m away from training. Minute measurements of time are crucial to my training and I think that I simply accept that accurate timing happens on a day-to-day basis. I don’t go for personal bests any more, I simply go on the track or road and do the best I can – and hopefully come away with the wins. As well as timing, there are all sorts of technology going into the sport. My £3,000 custom-built, black-carbon racing wheelchair is built from the same wonder material as a Formula 1 car. The F1s use carbon fibre as the ultimate material to provide them with an aerodynamic and high performing vehicle and we have learnt a lot from this. Carbon fibre provides a stiff, rigid form that flexes just the right amount, saves weight – and produces great looking forms. A watch is important to me. It’s symbolic as it reminds me that everyday is for living and time is very much ticking and you have to live life to the full as best you can. I still remember my first watch. I bought it at the Paralympics in Atlanta in 1996 and I purchased it in the Athletes’ Village – it was a Swatch! My current watch is an Omega Speedmaster. I love it as it is big and bulky which suits me as my wrists are quite big but unfortunately I cannot wear it when I am racing as I have my racing gloves on. In 2013, I co-founded the Weir Archer Academy, along with my coach Jenny Archer, to nurture the next generation of Paralympians. The Academy is based at Kingsmeadow Athletics Stadium in Surrey and focuses on athletes from all Paralympic disciplines in south London. I want this to be my legacy so that London 2012 is not just a one-off. There are literally thousands of potential athletes out there who are just waiting to be discovered and I want to help with that. I’m looking at the future and the Paralympics that are coming up because I want us to have a big squad in Rio 2016 and beyond. My aim is to have a new generation of wheelchair racers ready to come forward once I retire from the sport.